Anyone remember a time when radio seemed friendly and informative, rather than hostile and manipulative? I do. And I remember when it changed in 1996, after Bill Clinton signed the Telecommunications Act into law, and suddenly, huge corporations like Clear Channel began using our public airwaves -- those scarce radio frequencies which are owned by us ALL -- as a hammer to pummel Clinton and all other Democrats. I've been working to correct the problem ever since 1998. 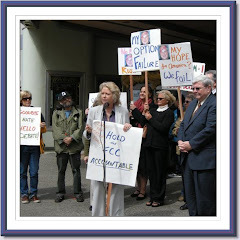 I've advocated rewriting the Telecommunications Act, made the film Broadcast Blues to educate people about the problem, founded the Media Action Center to get local groups communicating with their local broadcasters, filed petitions to deny stations' licenses, and more. But now, I believe I have found the legal means to put Talk Radio on trial at the FCC -- and perhaps eventually at the Supreme Court. There is a little known regulation at the FCC called the Zapple Doctrine, which is an offshoot of the Fairness Doctrine and of Section 315(a) of the Communications Act, which says that, in the 60 days prior to an election, if a broadcaster offers free airtime to one major party candidate, it must offer free airtime to the other major party candidate. Zapple expands this definition to include supporters of candidates. The only programs which are exempt from this definition must qualify as "Bonafide News." To qualify as "bonafide news," programs must be non-political and not support any candidates. What an interesting regulation. Gee, if I could only prove that stations were violating it, but what a task. Luckily, last fall, when I toured Wisconsin with my film Broadcast Blues, I met people in the Milwaukee area who were incensed that the five -- count them, five -- local talk radio hosts and their guests and callers were using our public airwaves on WISN and WTMJ to exclusively promote GOP candidates. Republican victors were crediting Talk Radio with their wins. Unions were crying because they were pouring thousands of dollars into advertising for their candidates on those stations, only to have those stations hammer them with free time. Then, the Wisconsin recall of Governor Scott Walker presented a golden opportunity: in this 28 day election, perhaps we could monitor the stations, see if they were in violation, and if so, complain to the FCC midway through to enforce the Zapple Doctrine. So we found five monitors and had them count how many minutes each program was specifically supporting Scott Walker or bashing his Democratic opponent Tom Barrett, or supporting the GOP and bashing Democrats, and vice versa, how many minutes they were supporting Democrats in the race. We discovered that each Right Wing Talk radio station in Milwaukee is giving about 80 minutes every day to the GOP side. Out of fifteen hours of programming, that doesn't sound like much, but it would cost between $34,000 and $68,000 for supporters of Tom Barrett and the Democrats to buy that time. That's $34,000-68,000 every single day. But are these shows "bonafide news?" Can they be exempted from the rule? When you have show hosts who are actively telling listeners to vote for Walker, when you have show hosts who are on the air recruiting volunteers for the Walker campaign, that would seem to indicate "political intent." And when you have the business community bragging about how Conservative Talk Radio is winning elections for the GOP, so business needs to expand Talk Radio into more and more local radio markets, political intent seems pretty clear. So May 24, with just twelve days left on the campaign period, I filed a formal complaint with the FCC, asking they immediately grant Barrett supporters the comparable time to which they are entitled on our public airwaves. But despite the results of the Scott Walker Recall Talk Radio monitoring report, despite the fact that Talk Radio is not bonafide news, despite the multiple requests made by Tom Barrett supporters to WISN and WTMJ for comparable time (as per FCC guidelines) this is no slam dunk to get the FCC to rule on behalf of We the People. Although its underpinnings come from Section 315 (a), the Zapple Doctrine was framed in context of the Fairness Doctrine, which went away in 1987, but was formally buried last July. The FCC says it is uncertain whether is still is enforceable given the absence of the Fairness Doctrine. But the intent of Section 315 (a) is clear, and even the original language of Zapple says the Commission can legally view supporters of candidates as a logical offshoot of the intent of that longstanding Congressional law. One thing is certain: we have proven that what Clear Channel (WISN) and Journal Communications (WTMJ) are doing on our publicly owned radio airwaves in Wisconsin is wanton with political intent, is violating the free speech of those Democrats who are being denied access on the scarce resource of radio (which the Supreme Court calls private censorship) and is damaging the fabric of our democracy. It will be nearly impossible for the FCC to ignore this, and even they concede this complaint is "huge," with constitutional ramifications. But the FCC needs to hear from people all over the country who want this narrow rule, that in the 60 days prior to an election, stations must provide comparable to BOTH major political parties, to survive. Please sign the petition at Media Action Center to help this once in a lifetime effort to change the Talk Radio dynamic for once -- and for ALL. You seem to have no trouble getting your point of view into the public discourse. Why don't you apply the same effort to the bias in the mainstream news casts that pretend to be offering news when really they offer opinion. Talk Radio clearly labels their product as opinion. Just because your product won't sell doesn't let you complain about the success of other's products. As for the airways being owned by ALL. Sure, you can think that way but frequencies were offered up for licensed uses. Was there anything biased in how those licenses were offered (I don't think so). Go back to the drawing board and figure out how to get a product to which people will listen. Do what I have done, conduct a study over what you are calling mainstream newscasts (what, ABC, CBS, and NBC?) and PROVE their bias, then you have the basis to take action. Talk radio calls itself "NewsTalk," and that's part of the problem, people do not know the difference between fact and opinion anymore, and big media likes it that way. Did you know that about 22% of America listens to talk radio, and about 22% of America says Talk radio is "news?" As to the licensing of radio and TV stations, those broadcasters made a deal with the public to get those free licenses: They can operate ONLY IF the "Serve the public interest." Putting pro-GOP and ONLY pro-GOP propaganda out over five local shows in one community in the 60 days before an election is serving the Republican interest, but not the entire public interest. Free Speech for ALL on radio! It seems as if the FCC is playing word games here. A little fun with semantics. Call it opinion when it's convenient for the ptb and then when it's not, call it "news interview program." Weisman gave very little information about the FCC's precedents that have been set, aside from naming "diverse" programs that it has tagged as "news interview programs." He doesn't say for what purpose, what the specific complaint was, and so forth. So to me, the conclusion is that the FCC isn't interested in keeping the airwaves public in any way shape or form--they are basically just tools. I mean, I may be surprised, but I doubt it.